Certainly, it was a big event to herald the release of a small book on a great man. 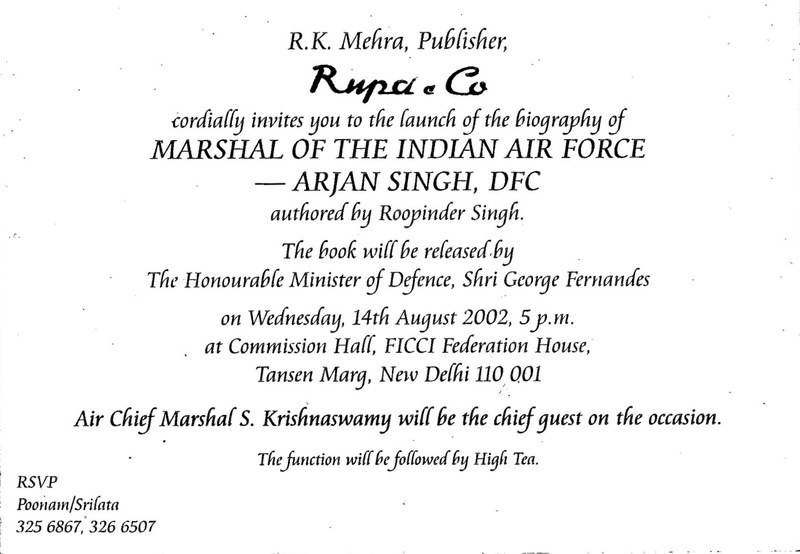 I still don’t know why Rupa and Co, my publishers, presented my first book to the public by holding such a big launch and inviting a number of important people to it, but I am grateful that they gave a lot of his admirers a chance to celebrate the greatness of Arjan Singh DFC, Marshal of the Indian Air Force, who is an exemplar to all of us. I had arrived in Delhi a few days before the launch with my parents, Giani Gurdit Singh and Mrs. Inderjit Kaur. On August 14, 2002, the first person that I met at the auditorium was R C Rajamani, my former colleague at The Tribune, who greeted me instead of the other way around! Gautam Singh the photographer par excellence came on assignment from The Times of India, and my old boss, Swaraj Chauhan was there. He had to be, since he was the person who had contacted me on behalf of Rupa and Co to write the book. The columnist Humra Quraishi came too to attend the event and write about it. The auditorium was full of Air Force Officers in uniform. Air Chief Marshal Srinivasapuram Krishnaswamy, PVSM AVSM VM and Bar was not wearing one, and neither was former Air Chief Marshal Anil Yashwant Tipnis, PVSM AVSM VM ADC, but it was a bit intimidating. Until a lady came up to me and said: “Sat Sri Akal ji. You have written a great book. I loved reading it.” She introduced herself as Mrs. Harveen Krishnaswamy, wife of Air Chief Marshal. They had met in Ambala. She chatted about Chandigarh and The Tribune, and somehow the world seemed small again. 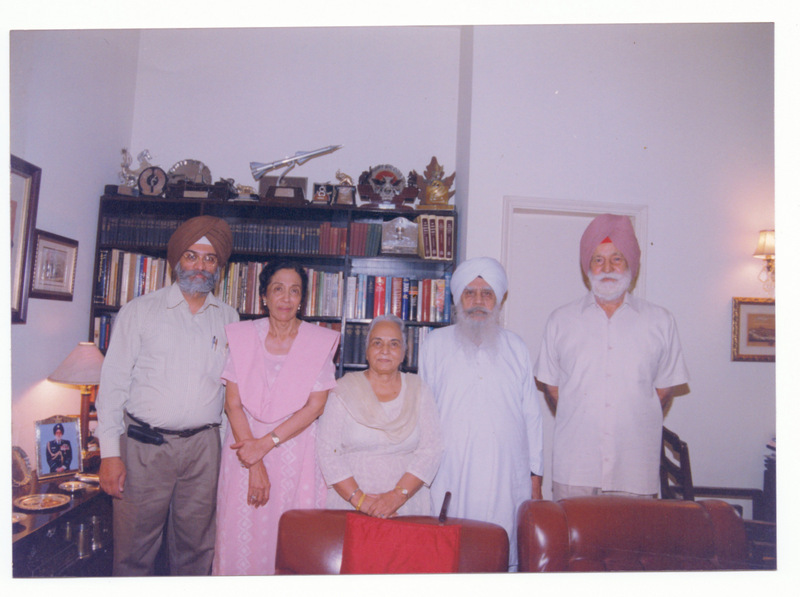 There was Brigadier Gurbax Singh, Khushwant Singh’s brother; Kishie Singh and Neena; Mrs. Raminder Kaur, Sardar Hukam Singh’s daughter; Nitya Ramakrishnan, her mother and her aunt… My teachers, Dr R K Gupta and Dr Vijay Tankha and their spouses, Urmila Gupta and Upinder Singh; old friend Jyoti Singh; Gurpreet Singh, Inderdeep Singh, Reena, Jasmer Sarna, were there in full force, as were other friends from college who I had been out of touch for such a long time. Family was expected to be there, and it was. Pirara Singh and my cousin Darshan Kaur; Kajal Nalwa, Salina and Ravi; Brig Arvninder Singh and Indu. Some friends like Drish and Bunny had driven from Chandigarh just to attend the event. He called the book a pictorial biography that is a part of Rupa’s Chritravali series. He described the first recipient of the five-star rank in the Indian Air Force as a legend and spoke of his extensive war-time career, which was followed by diplomatic and gubernatorial assignments. 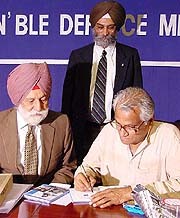 Defence Minister George Fernandes released the book. In his address, he declared that his ministry would make public India’s war records. He made a strong plea for recording the battle history of the country. He also paid rich tributes to the Marshal of the Indian Air Force and urged him to write an account of his war activities. Talking about the book, he said that he wanted it to be translated into first into Hindi and then in other regional languages. When I spoke, I thanked the Marshal and his wife Teji Arjan Singh who had so meticulously collected the documents and the pictures that form a vital part of the book. I also thanked my parents, my pillars of strength, and my teachers, to whom I owe so much. 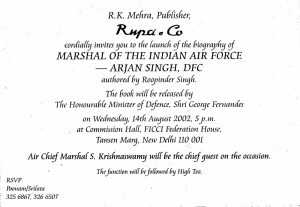 I narrated that how at the very outset the Marshal of the Indian Air Force said that he did not want too many positives in the book. He wanted a warts-and-all biography. While writing the book, almost everyone who I mentioned his name to, whether in Amritsar or in Chandigarh or at Delhi had an anecdote to relate about the MIAF, He is the kind of a person I want my children to become. The FICCI auditorium was full—standing room only. Just after the function, there was an orderly queue of people who wanted autographed copies of the book — a heady experience indeed. The Defence Ministry has accepted the recommendations of a high-powered committee to make public the war records of the 1962 Sino-Indian conflict, 1965 and 1971 Indo-Pakistan war as well as experiences of the Indian army in the peace-keeping role in Sri Lanka. Defence Minister George Fernandes while declaring that the Nation had the right to know the truth about the details of the post-independence wars fought by India announced that the ministry had decided to accept the recommendations of the committee which went into the issue. “The truth about what went wrong, where and why should not embarrass anyone and it is a must that we don’t repeat the mistakes of the past,” Mr. rnandes observed at a function here. He said the recommendations of a high-powered committee on making public these war records would soon be implemented. 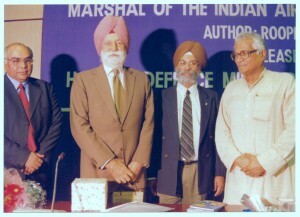 Speaking after formally releasing a biography of “Marshal of the Indian Air Force: Arjan Singh”, written by The Tribune’s Assistant Editor Roopinder Singh, the Defence Minister said national defence in India had suffered over the centuries as Indians did not care much for battle history. “If we learnt from past battle mistakes, we would not be facing such security threats as we do at present,” Mr Fernandes said as he lamented that India over the years had failed to pen down the details of historic battles fought on Indian Soil. Though the Defence Ministry has come out with an official account of the 1947-48 Kashmir operations, it has not come out with war records of the 1962 Sino-Indian as well as 1965 and 1971 Indo-Pakistan war. The Defence Minister in this context also urged the Marshal of the IAF to pen down his memoirs and said writing about the history of wars was somehow not approved not only by the military establishment in the country but also by the government. “For whatever reasons there seems to be a fear of letting the nation know about the truth,” he said. Earlier Chief of Air Staff Air Chief Marshal S. Krishnaswamy said the IAF owed a great deal to the Marshal of the IAF and recalled his days as a junior officer under the then Chief of Air Staff Air Chief Marshal Arjan Singh. He said thanks to him and many others the IAF had been able to prove its battle worthiness in the very year of its inception.